As winter morphs into spring, it’s time for everyone’s favorite fruit to hit the marketplace: strawberries. Although strawberries are available in most places all year ‘round, their peak seasons – when they’re at their reddest, juiciest, and most delectable – are spring and summer. Their sweetness and juiciness have earned them a reputation of being nature’s candy, loved by children and adults alike. Whether you like your strawbs straight up, dipped in sugar, or smothered in whipped cream, now is the time to put them on your produce list and bring them home to enjoy. Strawberries are members of the Rosaceae family, and they are known botanically as Fragaria ananassa. Technically and botanically speaking, strawberries, like raspberries, aren’t really berries. While true berries stem from one flower with one ovary and typically have several seeds, strawberries are derived from a single flower with more than one ovary, making them what is known as an “aggregate” fruit, fruits that develop from multiple ovaries of a single fruit. Strawberries have a long and impressive history; they have been enjoyed since the Roman times when the ancient Romans thought strawberries had medicinal powers. They used them to treat everything from depression to fever, from kidney stones to sore throats. Crossbreeding has led to hundreds of varieties, which are native to many parts of the world. 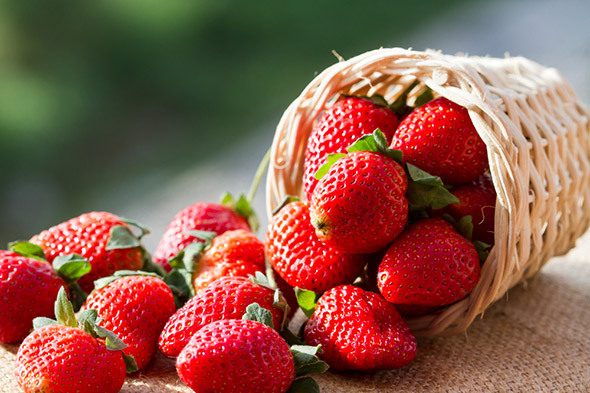 In the early 18th century, a French engineer who worked in South America noticed that the strawberries native to Chile and Peru were much larger than those found in Europe. After he brought back a sample of this strawberry to cultivate in France, the result was a large, juicy hybrid that became extremely popular in Europe, enjoyed at first only by royalty. In North America, Native Americans ate strawberries long before European settlers arrived. As spring’s first fruit, they were a treat, eaten freshly picked or baked into cornbread. Today, strawberries are enjoyed around the world – and in large quantities. Americans eat an average of 3.5 pounds of fresh strawberries per person per year (even more if you count frozen strawberries). Elsewhere in the world strawberries are equally popular; there is, for example, a strawberry museum in Belgium, in the town of Wépion. Wépion’s berries are known throughout the country, and the town’s Musée de la Fraise, or Strawberry Museum, is a popular attraction. The tiny museum tells the history of strawberry growing and production in the region and the gift shop offers strawberry-based delicacies, such as strawberry jam and strawberry beer. There are hundreds of varieties of strawberries; each cultivar (type) has its own unique characteristics, flavor, size, shape, and color. The three main types of commercially grown strawberries are June-bearing, everbearing, and day-neutral. June-bearing strawberries are harvested in June and they are the most common, the most popular, and the largest strawberry. Everbearing strawberry plants produce fruit throughout an entire growing season, starting in spring, and produce intermittent crops throughout summer and early fall. Day-neutral strawberries are a modern type of strawberry that was developed from everbearing plants to produce continuously all summer and into the fall (as opposed to the original everbearing types, which produce two to three separate crops each growing season). Everbearing strawberries thrive in hotter climates, while day-neutral strawberries are oblivious to temperature, and flower and fruit for about five months. All strawberries have a heart-like shape, although they can vary in size depending upon variety and growing conditions. All cultivars of strawberries have seeds on the outside and not inside – an average of 200 seeds per fruit – which, again, distinguishes them from “real” berries. When they are fully ripe, they have a bright red sheen and a juicy, firm texture. The strawberry plant is a perennial. This means if you plant one now, it will come back year after year. It may not bear fruit immediately, but once it does, it will remain productive for about five years. Strawberries are the most cultivated “berry” in the United States. They are grown in every state but most commercial strawberries are grown in the warm climes of California or Florida, where the strawberry growing season runs from January through November. California produces about 80% of the strawberries in the U.S., growing about 2 billion pounds of the fruit per year. Strawberries are an excellent source of vitamins A, C, E and the B-complex group as well as minerals such as, potassium, manganese, fluorine, copper, iron and iodine. They are rich in antioxidants, and may have benefits for heart health. One cup of whole strawberries (about 5 oz.) contains less than 50 calories. Strawberries have been shown to increase blood and oxygen flow to the muscles, and research indicates that people who load up on strawberries before exercising have greater endurance and burn more calories. Strawberries also contain significant amounts of phytonutrients and flavonoids, which contribute to their bright red color. They have been used throughout history in medicinal applications to help with digestive ailments, teeth whitening, and skin irritations. Their fiber and fructose content may help regulate blood sugar levels by slowing digestion. Strawberry leaves – the green crown atop each strawb – can be steeped for tea. Choose plump, bright, dry, firm, shiny berries that still have fresh-looking green caps attached. Avoid soft, dull-looking, or shriveled berries. 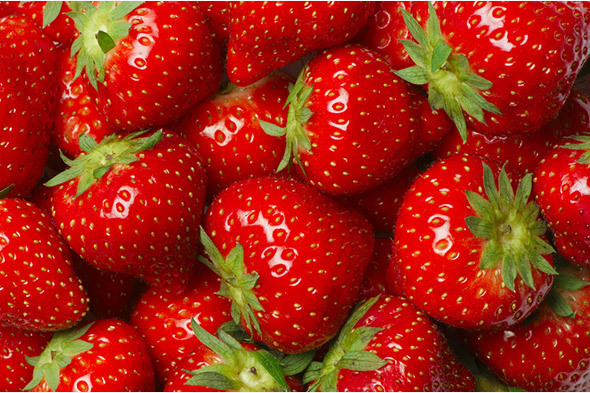 Strawberries do not ripen after being picked, so don’t buy berries that are partly white or otherwise unripe. Strawberries should also have a distinctive, inviting strawberry scent, so take a whiff before you buy and choose another batch if they don’t smell right. If you have a choice, buy local strawberries; if they come from far away, they have to be picked before they’re ripe, which means less flavor. Although strawberries are available all year round, if they are sold in the winter they will probably be either imported or too resilient a variety to taste very good. If you can, wait until the spring for the best strawberries. 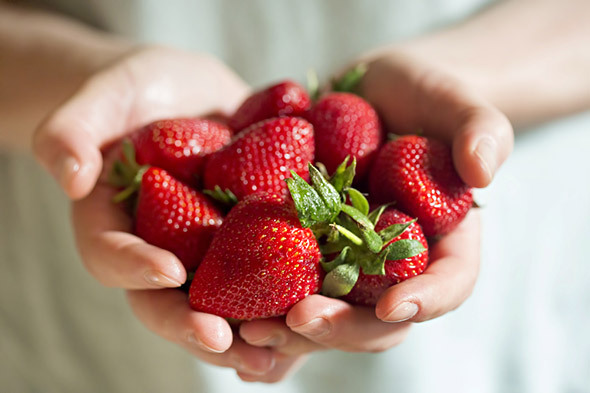 For the third year in a row, strawberries top the “Dirty Dozen” list put out by the Environmental Working Group (EWG). The list ranks popular fruits and vegetables based on pesticide contamination, so heading the list is not exactly a badge of honor for the strawberry. If you have a choice, consider buying organic, which taste as good if not better than regular strawberries and won’t have a ton of pesticides in every bite. If you plan to keep strawberries in the fridge for a few days, wait until you eat them to clean them. Rinsing them speeds up spoiling. You should store in the refrigerator, in a paper-towel-lined moisture-proof container, for a maximum of two or three days. Once you’re ready to eat the strawberries place them in a large colander and rinse gently with cool water. Lay strawberries in a single layer on a dry kitchen towel and pat dry. To hull the strawberries – removing the green caps from the fruit – place the tip of your knife at the base of the cap, insert gently to remove only the soft white part at the base of the stem, and gently turn the strawberry. When you come all the way around, the top should pop right off. Freezing strawberries is easy; just hull them, lay them in a single layer on a baking sheet, freeze them until they’re solid, and transfer them to a Ziploc storage bag. Frozen strawberries will keep up to six months or even longer, and they’re great in shakes and in plenty of other recipes that call for fresh strawberries. Strawberries are a versatile fruit; use them raw in salads or reduce them into syrup for drizzling over ice cream and cheesecake. 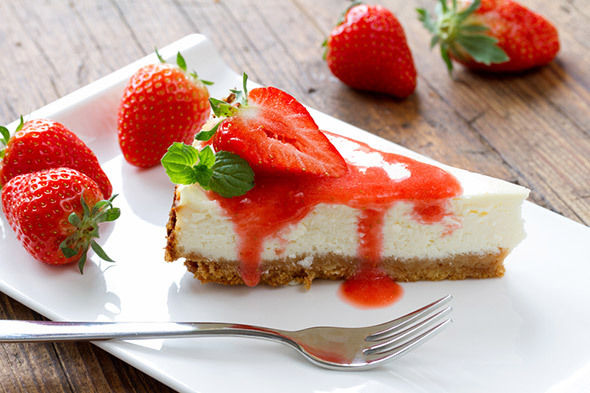 Or, speaking of cheesecake, whole strawberries make a beautiful and regal topping for any cheesecake. However, perhaps the easiest and quickest way to use strawberries is to dip them in chocolate. This quick dessert belies its simplicity and will be a hit with diners of all ages. Put the semisweet and white chocolates into separate microwave-proof medium bowls. Melt the chocolates in a microwave at half power for 1 minute, stir and then heat for another minute or until melted. Line a sheet pan with parchment paper. Holding the strawberry by the stem, dip the fruit into the dark chocolate about three-quarters of the way, lift and twist slightly, letting any excess chocolate fall back into the bowl. Set strawberries on the parchment paper. Repeat with the rest of the strawberries. On your mark, get set, it’s strawberry season! So waste no time getting to your local market and choosing the ripest and most beautiful strawbs to eat out of your hand, incorporate in a delicious recipe, or freeze for later use. Regardless of how you like your strawberries, they are nature’s gift to us and should be enjoyed for all their goodness, health benefits, flavor, and versatility. This entry was posted in Cooking Tips, Food Guides, Recipes and tagged fruit, health, healthy, strawberries. Bookmark the permalink.